...or, how 15 minutes with two Berliners made me wish I was one. "Architekt Koher und sein freund Hans Fischer, gehen sum bibliothek." (translation: Architect Kohler and his friend Hans Fisher walked to the library." The humor, as far as we are concerned, was the woman doing the speaking in the filmstrip. Her inflection, and her apparent glee that these two were going to the library together. Yes, we are easily amused...and for decades over this. So we thought it would be hilarious if we met two Germans who could live up to Herr Kohler and his book loving friend. 1. He likes to photo bomb. Not sure if it is just obvious looking tourists, or if he is equal opportunity. But it is an activity he does to help pass the time while his wife is shopping. 2. Once she tracked down her husband, she clarified that she wasn't shopping. She was "returning". What? A shirt she purchased for her husband because he became "too round". 3. 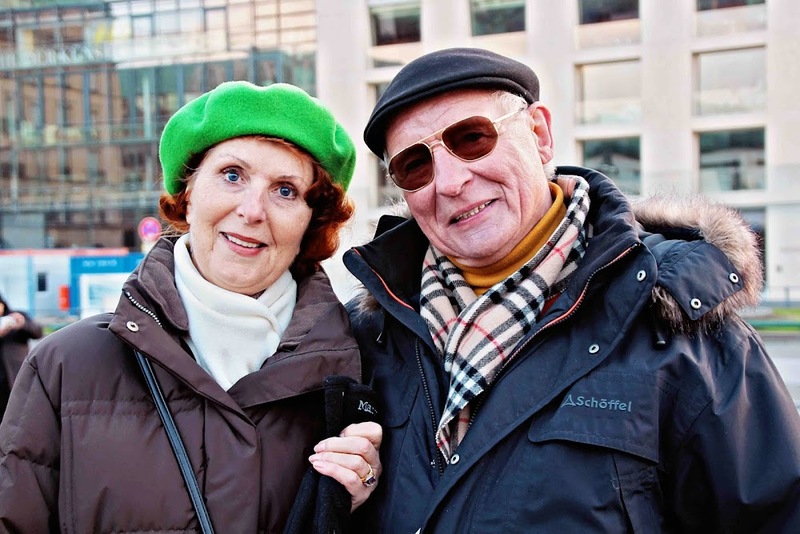 They are both life long Berliners. Ironically, he was born in 1937. The same year as my mom. They both declared 1937 was the best year with the best babies. Altho, over dinner that evening we had to reassure mom that she looks waaaaaay younger than Herr Photo Bomb. 4. They have obviously seen and experienced many, many changes in Berlin during their lifetime. And have personally witnessed incredible historical events. He was present at the Brandenburg Gate when President Ronald Reagan implored Gorbechev to "Tear down this wall". He showed us where Reagen stood, and where he pointed during his speech. 5. He is not a fan of President Obama. Altho he does think Obama is a great "speech maker". He is not in striking up conversation with strangers, or voicing his opinions. He loved Ronald Reagan. Referred to Hitler as "that evil man". And his wife says he...talks too much and should learn better English. But, he is too lazy. "Herr Photo Bomb und seine Frau, um mich wunschte ich war ein Berliner zu." (translation: Mr. Photo Bomb and his wife, make me wish I was a Berliner too." Fifteen minutes. That's all it took for these two to totally make my day in Berlin. And totally forget about Architect Kohler and his friend Hans Fischer. Vielen Dank! Absolutely delightful post! My husband met many wonderful German people when he was in that country back in the early 80s. oh this was a fun post and gorgeous portrait...i had to laugh when you had to assure your mom she doesn't look as old :D thank you for linking and hope you are having a super weekend!